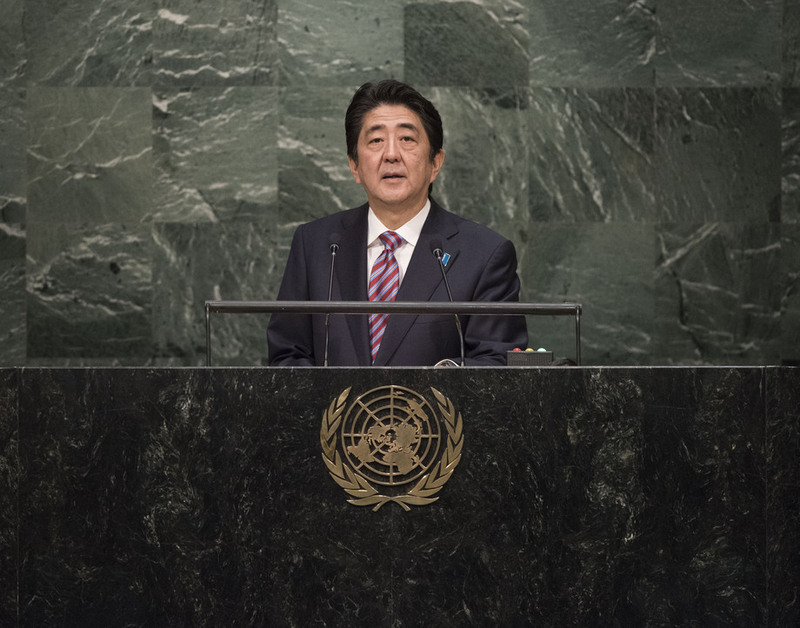 SHINZO ABE, Prime Minister of Japan, highlighted his support for nation-building, citing work to foster human resources, provide assistance and uphold women’s rights. Japan would enhance its assistance to refugees and internally displaced persons from Syria and Iraq, which, this year, totalled $810 million, or triple the amount it provided in 2014. In Lebanon, Japan would provide $2 million in new assistance. Moreover, it would provide $2.5 million for European Union neighbors struggling to accept refugees and migrants, including Serbia and the former Yugoslav Republic of Macedonia. In Iraq, Japan was preparing $750 million to help build peace, and ensure it was maintained across the Middle East. “In rebuilding devastated countries”, he said, “…cultivating from a grass-roots level each person’s capacity to fight fear and want is, in fact, the shortest path there”. It was from that belief that Japan valued health and education through a policy of human security, a point driven home by a photograph he had seen of a young woman who had fled a refugee camp near Damascus. In her bag, she carried a maternal and child health handbook that Japan had distributed at camps in Syria, Palestine and Jordan in hopes that a mother’s love could transform the soil that sometimes created despair. Japan valued the rule of law — and equality before the law — more highly than any other principle, he said, highlighting work to train police in Afghanistan and the Democratic Republic of the Congo, notably through the Japan International Cooperation Agency, which had trained more than 20,000 people. “I am second to none in looking to women as the ones to take on many of the roles that will carve out Japan’s future,” he said. Japanese women were helping countries emerging from conflict to uphold the rule of law, and for the second year, Japan had hosted the World Assembly for Women. As the United Nations did not “avert its eyes” from actual situations, he turned to that in North Korea, saying Japan would work with relevant countries towards the comprehensive resolution of outstanding issues, including abduction, nuclear and missile matters. In some areas, there appeared to be increases in nuclear arsenals, without transparency. The United States and the Russian Federation should proceed with weapons reductions, as should other States. Japan was preparing a resolution to promote international action on that issue. Moreover, Japan would pursue Security Council reform through cooperation with the Assembly President, and it was seeking a permanent seat. Citing peacekeeping work in South Sudan, Kenya, Uganda and elsewhere, he said Japan also had laid the legal domestic framework to contribute to such efforts.